Use strong verbs and nouns and only a few excellent modifiers (adjectives and adverbs) when you must. As an Orthodox Christian, I am not concerned that the art I create be “Orthodox art” or “Christian art.” (Unless I am writing icons, which are one form of liturgical art. Other forms include liturgical music and architecture. Liturgical art has its own set of guidelines.) I am an Orthodox Christian who writes novels, memoirs, essays and blog posts, and the occasional (mediocre) poem. I was even hesitant to join the Orthobloggers at first, simply because I do not have an “Orthodox blog.” I write about many topics on my blog, and Orthodoxy is only one of them. God gives us particular Verbs that transform us into particular Nouns…. Too often we think we can take this type of lifestyle, and that kind of activity, mix it up with our own personal preferences, and then add a little bit of “Christian” to it and feel good that our lives are conforming to the Gospel. We assemble ‘nouns’ and ‘verbs’ of our own liking, and then add the “Christian” adjective. But this is just not how it works…. The Gospel comes as a set of Verbs (of actions, an entire life with Christ, care for the outcast, love for one another) which form us into a set of Nouns (children of God, the body of Christ, a temple of the Holy Spirit). “Christian” is not an adjective. If it is then we have lost ourselves. Most writers set out to tell a story, knowing that who they are and what they believe will whisper its way in just as they do in daily life; their personality and beliefs will sink below the word-surface like a stain; they will be inside events the way the peach seed grows inside the peach. Flannery O’Connor believed this, as did Madeleine L’Engle. They both saw themselves as Christians (noun) who write (verb). Would I describe it as a “Christian” novel? That durable noun first used to name the saints at Antioch seems to spoil to a rancid adjective with a slight whiff of the Pharisee. Between Pittsboro, where I live, and a neighboring town is a gas station with a sign: WE TITHE. 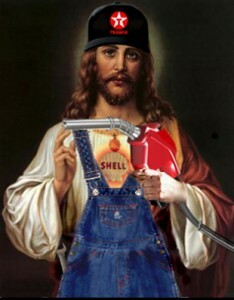 BUY GAS FOR JESUS. I drive on by. Dn Stephen Hayes of Khanya on What’s that you were saying? Elizabeth Perdomo of Living a Liturgical Life on What About Words? Fr John D’Alton of Fr John D’Alton on How we use our words- jihad or struggle? I agree, Susan. I am a writer. I strive to be a Christian. The two inform each other naturally because I’m a whole person. I must be missing the point. Why does one need to Name or Adjectify oneself as a Christian. It is similar to a dispute several years ago when the Catholic and Episcopal churches both wanted to claim the same person as a saint, when it is only God who makes saints. The only reason I would have for naming myself a christian is to describe myself to those who do not know me, basically a political activity (in the broad sense of the word). I consider one’s beliefs a private matter. A political christian sounds like an oxymoron who is trying to serve two masters. A postman works for the government and in that role has some authority, which does not follow him when he leaves the office. Likewise, would it not be the case that only those actions completed under the direction of Jesus would be Christian actions and only those people who were at that moment fulfilling that Christian action, deserving of the name, Christian? Those of us who follow the directive “to sit at the lowest place at the table”, might hesitate to call themselves Christian. We try. We fail. Forgiven, we try again. I don’t see any glory in that. Call yourself Christian is something else, it all sounds a little like name dropping, “I know Jesus, who do you know” and not like taking the “road less traveled” because He did. Hi, Steve. Thanks for reading and commenting. I’ll try to respond with as much clarity as possible. I think you ARE missing the point, as you suggest in your comment. This post is not about whether or not a person calls himself a Christian… it’s about using “Christian” as an adjective… i.e. Christian music, Christian writing, etc. I think you are addressing the word, “Christian,” when it’s used as a noun. Jesus’ disciples called themselves Christians (Acts 11:26) not to be “name droppers” but to identify themselves as a group, which eventually became the Church. When I say I’m a Christian, I’m not saying that my behavior is always Christ-like… it often is not. But fortunately Christ does not kick me out of the family when I misbehave. I am still a Christian. And I DO believe there is glory in trying, failing, being forgiven, and trying again. Your blog was understood to contrast the use of the word Christian as a name as opposed to its use as an adjective and finding that its proper use is as a name. I hoped to indicate that even the use of the word as a name had some of the same failings as its use as an adjective. Obviously this is definition encompasses both uses, is from an external view point and does not address the issues you raise, because, I believe, your view point is refined and conformed by your personal knowledge of being a Christian, i.e., an internal view point. My comments were an attempt to indicate that in my internal view, naming yourself a Christian while focused on an activity that was not specifically Christian in nature contains the same failings as using Christian as an adjective. While you are a Postman at work, it would be incorrect to describe you in your easy chair watching the news and sports as a Postman. Also the requirements of being a Postman; dress, sobriety, attention to detail and others, are not specifically required of you while off duty. You mention that the word Christian was in the Bible and first used in Antioch. You did not mention that this is the only place in the Bible the word Christian is used, which indicates a connection between the word and the activities described in the Book of Acts. In Acts 4 31 – 35 there is more illuminating information about those called Christians. 31 And when they had prayed, the place was shaken where they were assembled together; and they were all filled with the Holy Ghost, and they spake the word of God with boldness. 32 And the multitude of them that believed were of one heart and of one soul: neither said any of them that ought of the things which he possessed was his own; but they had all things common. 33 And with great power gave the apostles witness of the resurrection of the Lord Jesus: and great grace was upon them all. 35 And laid them down at the apostles’ feet: and distribution was made unto every man according as he had need. While not requiring one to be exactly walk in the same foot prints of Jesus, it is clear that these Christians lived in circumstances that are not in evidence today and this as a definition, we are all excluded. Yes, there are those who live in monastic communities who hold everything in common, but, they are Catholic, Protestant or Orthodox. In Orthodoxy, each is in their own Jurisdiction and for the Russians they have two choices. Who then fits this description? The strife, conflict, animosity and between those who call themselves followers of Christ, belies the name Christian and the original Christians who “were of one heart and of one soul: neither said any of them that ought of the things which he possessed was his own; but they had all things common.” Instead, many of us called by this name act as if the church we attend is something we own and are willing to contest with others, less fortunate, who belong to a false or lesser church. As you say there may be some glory in repeatedly trying, failing and trying again, but there is a chasm between that glory and claiming it. Orthodoxy is current today even though they have not changed their liturgy since St John Chrysostom or St Basil the Great, because there are those potential saints living in obscurity today who through their devotion to Jesus become little conduits of reality into our world. If any, they should call themselves Christians. From reading of them, it seems they would not call themselves such. They definitely will tell you that they are followers of Christ, but they might tell you, so poor followers that none should emulate them. In the light of such, isn’t my naming the glory coming from my meager sufferings and self-centered spiritual wonders, more like name dropping or trying to give myself airs when compared to those who to me are spiritual giants and to themselves the worse of all sinners. Steve, you are certainly holding my feet to the fire:-) I think I would use the word “saint” to describe the people whom you would called “Christian.” And again, those are nouns, and I guess you and I disagree about their use. If salvation is what is at stake here, all I can do is implore God’s help and hope for His mercy. Susan, it is hoped that we are not contesting, but, as fellow travelers on the same road, can help each other. Furthermore, I admire writers, not only for their abilities, but for what they risk. They send their work, like children, into a harsh world, not knowing how they will grow or what they will eventually become. You should know that my end of this conversation is not some pat practiced rhetoric that I trot out whenever I get the chance. Having responded, I am committed to following through, reluctant or not, once the roller coaster starts, you can’t get off until the end. Isn’t that another risk they take, like setting the spade deep in earth during a groundbreaking, the writer doesn’t know what they will find when they start to write. The dirt may be hard, soft, rocky, bedrock or it may break through into something else entirely different that, like the recent home owner who discovered a sink hole in his back yard, threatens your very foundation. In that vein, I hope the “feet to the fire” reference is entirely metaphorical, because I did not intend to pull you down and the fire is not of my making. So the question at hand is this, “Is ‘Christian’ something the disciples called themselves or something they were called by others?”. Is it a name or a brand? Is it something true or a derogatory term? For the longest time we called the Indian tribe the Sioux, until we found out it was a derogatory term, literally little snake in the grass, told to early European explorers by a rival tribe. They are the Lakota, but they do not call themselves that, because the word means ‘the people’. Others call them that, because, they do not understand the meaning of ‘Lakota’. If they did translate it, how then do they differentiate between I, the people, and Thou, the people? The simple answer, you don’t because we are all the same, we are the people. Isn’t the term, Christian, to those practicing Jesus’ teachings, the same as the term, Lakota. We are the people and they are the others. Because it is linguistically absurd, at Liturgy, we don’t say to one another, “Hello, I’m a Christian.” It sounds a little like a self-help group seeking to name and overcome our personal weakness. “Hello. My name is Steve and I’m a Christian. I’ve been one for ……..” Calling ourselves Christian has no meaning unless we are talking to someone outside of our group, but why would we do that? We don’t hide our practice, but why brand it, why brand ourselves? And the answer is, “Marketing”. With the lack of a handshake or sign, like drawing a fish shape in the dirt with a stick, today we identify ourselves to others who may be one of ‘the people’ using the term Christian, but what does that really mean. Around us there are more types of Christians than types of tooth paste in the super market. In really isn’t this just selling yourself to gain entry? An Orthodox priest one told me, “If someone is so imbued with the Holy Spirit that it flows in their actions, I can see that. If not, I don’t know anything about them.” We see others doing what looks like good and bad things, but we know nothing of intent, of how God sees them. I know more people washing up after coffee hour, who are nervous, want something to do with their hands, are ‘grace hogs’ and Just want to be where the gossip is, than I do folks who wash dishes for the love of God or just because the dishes are there and they’re dirty. What does the stranger really mean when they tell me they are a Christian? In my darkest hours, it is people like Mary of Egypt who give me hope. She was so low on the “good guy” scale that a spiritual wall stopped her from entering the church. Stunned, she fled to the desert to find repentance and acceptance into the church. She may never have set foot into a church building and never enjoyed the company Christians, but she did, day by day, overcome all bad she had done and became one of those so imbued with the Holy Spirit that it flows in their actions. She had no brand and no PR firm and we only know of her because another religious man took a short retreat into the harsh desert where Mary lived most of her life. On those dark nights when our souls preview our future, all the ‘them’ are far away and the ‘us’ is a soul and its maker. This must be the place where Mary lived her life. A place where there is no strength to say anything good about yourself, let alone, have the presumption of taking on fancy titles like ‘Christian’. Those who, like Elizabeth Gouge, infuse their lives and writing with the fruits of those dark hours, do us a great service. It may be that the wall between I and Thou must fall in relationship, by talking, by your writing and my reading or by being in the same place when such a dark moment arrives before we can talk about such things. It is hoped that our conversation, public though it may be, might surprise us both with new insight. As for the others and what they call us, let them call us what they will. They will anyway. I am definitely not “contesting” with you, Steve. As a writer, one of my goals is to cause a reaction in the reader, so I guess I’ve succeeded with this post, at least where you are concerned. I do see something we have in common–an admiration for Mary of Egypt and Elizabeth Gouge. Mary of Egypt is my patron saint, and she is actually one of the three main characters in the novel I’m finishing up now. Elizabeth Gouge’s novels are, as you say, infused with dark hours. I’m hoping that mine is, as well. Thanks again, for reading and commenting.